Finding the perfect gift can be tricky for anyone from your new neighbor to your long time best friend. DIY and handmade gifts are a great way to give something special and also keep an eye on budget, but then there’s the challenge of what to make. Browse our ideas for DIY photo gifts below that you can customize quickly and still leave a lasting impression. With our easy and free Shutterfly app, you can even shop, personalize and purchase on the go for celebrations that sneak up on you like grandad’s birthday or your bestie’s promotion. If your loved one is always jet setting, a personalized luggage tag is part fashion and function. Make it a bright color so they can spot it in the carousel after a long flight. Personalizing it with a thoughtful photo, like your last beach vacation or a lazy Sunday spent at home, will make them feel closer when they’re miles away. Coasters make for the perfect housewarming gift to welcome new neighbors or say goodbye to parting friends. Add photos of their favorite spots in the neighborhood, like their weekend coffee spot, the local pub or a picturesque park. Every time they take a sip, they’ll be reminded of how great their community is. A photo book is the ultimate DIY photo gift. Completely versatile from cover to cover, you can make your photo book about anything. For new parents, create a baby photo book filled with touching family moments. If you’re a newlywed surprise your partner with a wedding photo book filled with your favorite memories. If it’s for your bestie, utilize their Instagram account for a book filled with their favorite snaps. Personalize a pillow as a fun accent piece you can’t find in the store. Include a vibrant chevron pattern, an inspiring quote or a photo to make it something your friend will cherish. Whether your friend is a decorating pro or needs a little help, a photo pillow is a easy way to brighten up a space. Have a friend or family member who is always in the kitchen? Gift your favorite gourmand with a personalized photo magnet. Include a photo from a recent foodie event, like the neighborhood BBQ they hosted last summer or your annual Thanksgiving feast. Pair your gift with recipe cards or a custom spice blend. Puzzles can make a perfect gift for any age—from your niece in elementary school to your grandfather. With the ability to personalize your puzzle you can make it extra special by adding a photo of the last family reunion, their favorite vacation spot or a goofy photo of you. For the person with endless wish lists, a personalized notepad can make jotting down reminders more fun. Add a photo of your last family outing as a gentle reminder of how much you love spending time with them. Or add a motivational quote to get them geared up every Monday. Another timeless pastime, playing cards are perfect for the Poker champ or the casual game night. Pick a photo that matches the spirit of their favorite game, like a playful photo for ‘Go Fish’ lovers or a serene landscape for nights of Texas Hold’em. Whether you’re eco-conscious or looking for a way to upgrade your grocery store shopping, these reusable shopping bags make gifting easy. Decorate it with a beautiful outdoor shot, like the peak of your favorite hiking trail or the sunset you caught. Turn your DIY bag into a personalized gift basket by including a gift card to a local delicatessen, homemade jams and unique snacks. Pack a double pick me up with a personalized mug. For the college grad gearing up for their first job or your nephew who loves hot chocolate, pair a mug with a photo that will make them smile. Complete the gift with a recipe for your favorite hot beverage or a gift card to a local coffee shop. Work doesn’t have to be all about the 9 to 5. Make a moment they’ll enjoy by personalizing a mouse pad for the professional in your life. Include a photo of their favorite vacation spot or your last family outing. They’ll be reminded of how much you appreciate their hard work. Whether they go to an office or work from home, a desktop plaque makes it so you’re always by their side. 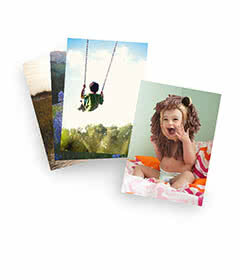 Personalize it with one photo or make it a collage of your favorites. Include photos from their recent birthday bash or a collage of the family pets. A canvas print is the perfect DIY photo gift if you want to make a big statement. Turn it into a luxe piece of artwork by including a photo they’re proud of, like catching the morning sunrise or capturing your little one in the perfect candid. Make dinner time fun for the little ones by personalizing each one! Add a photo of each kid to their respective placemat so they know which one is theirs when they set the table. Pair the photo gift with other treats, like their favorite snack or personalized drinking cups to match. These personalized ceramic tiles are a great way to add some luxe to your living room. Each comes with their own wrought iron easel so you can display them easily. Pick a family photo and pair it with some flowers or a new book to create some serious bookcase envy. To keep cozy on cold winter nights or on hand for an impromptu picnic, these photo blankets are a unique DIY gift. For families, you can make is a collage of action shots from the kid’s favorite sports. Or try it for the college grad by decorating it with photos from Greek life or your study abroad trip. Everyone needs their smartphone at all times, so why not make their precious tech even more special? Include a photo of the family pet, grandkids or their favorite getaway as a way to remind them to send you a call or text. Pair your smartphone gift with other tech essentials, like new headphones or a portable charger.